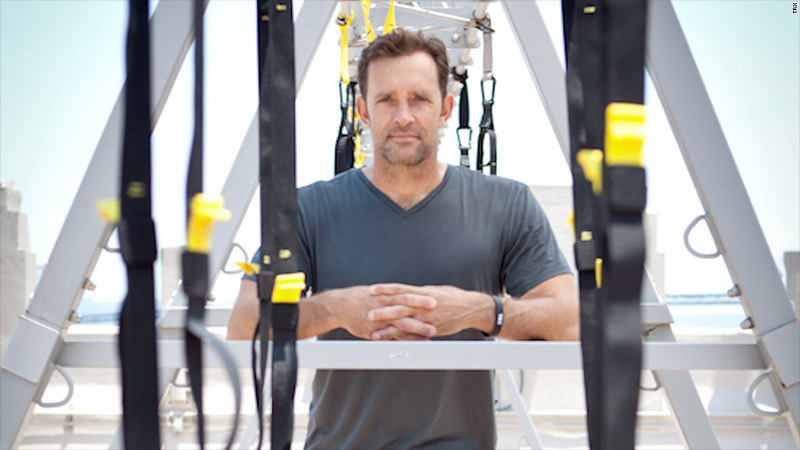 Randy Hetrick served 14 years as a Navy SEAL before launching fitness company TRX. The idea for Randy Hetrick's business, TRX Training, came to him in a warehouse in Southeast Asia. A Navy SEAL, Hetrick was preparing for a counter-piracy mission and wanted to make sure his team stayed fit while overseas. The contraption consisted of an old jiu-jitsu belt he mistakenly brought in his bag and some extra parachute webbing. He tied a knot and threw the straps over the door, using it to do weight training exercises like pull-ups and curls. The gear kept him and his team members in shape and ready for duty while deployed for weeks in remote areas across the world. About four years later, after 14 years of service, Hetrick returned home, got an MBA from Stanford, and launched TRX. The prototype created in Asia wasn't too far from the suspension training gear that you see hanging from the ceiling at your local gym. In its eighth year, the company now brings in more than $50 million in annual revenue. Hetrick is one of many veterans-turned entrepreneurs. The Small Business Association says that nearly 1 in 10 of all American businesses are owned by veterans. And many of those veteran business owners often hire other vets. Hetrick, for example, has at least 20 veterans on staff -- about 20% of his workforce -- because he knows they're accountable, resourceful and can work well with teams. Yet, many ex-military members don't always find it that easy to land a job. Over the past several years, veterans have faced an unfriendly job market. The latest unemployment rate for veterans who have served since 9/11 stands at 10%, while the unemployment rate for the non-veteran population is 6.8%. Part of the problem: Veterans don't know where to look and they don't know how to market themselves, said Eric Eversole, the executive director of Hiring Our Heroes. Many have trouble explaining what they did in the military in civilian terms, he said. "Companies want to hire veterans, but they're often looking for a particular skill set," Eversole said. So Hiring Our Heroes aims to help service members identify skills they may have and match them with a company looking for the same, even before leaving the military. But veterans also have valuable intangible skills like leadership. "One thing the military does really well is provide leadership training and education," said Ken Taylor, another former Navy SEAL. He was one of Hetrick's first hires. Leading a group was something Taylor did every day in the service. "The guy had never been in business, but has led a lot of initiatives and approaches them like he would preparing his troop for an operation," Hetrick said. Despite his lack of sales experience (he was a theater major before serving 20 years in the military), Taylor now heads government accounts for TRX, one of the largest parts of the company. "They can make a tough decision in what can be a very chaotic environment, and that's a valuable skill for business," he said.